Can’t Stop the Serenity is back in Melbourne for its 10th year! 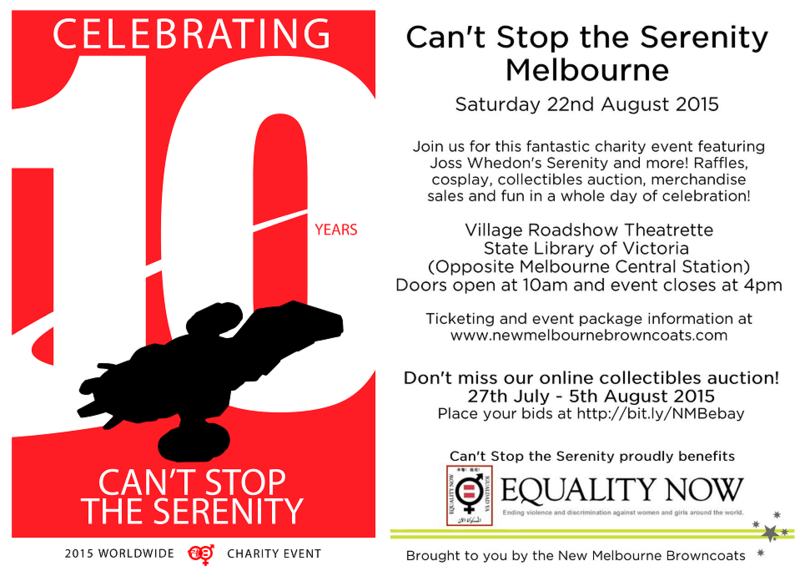 Join us for this fantastic charity event featuring Joss Whedon’s Serenity and more! Raffles, cosplay, collectibles auction, merchandise sales and fun in a whole day of celebration! Want a whole weekend of fun? This year, we’ve got a whole weekend of events and activities planned in addition to CSTS), so make sure to check out the Sereniversary Weekend page for all the details! Don’t miss our online auction, featuring some fantastic collectibles and memorabilia! Can’t Stop the Serenity proudly benefits Equality Now. Want to learn more about Can’t Stop the Serenity?